Finally, after being in Darwin for the last long 7 months working and enduring the humidity and heat we were ready to leave. Added to this there was a cyclone expected to hit Darwin in 2 days time, so we were understandably excited as we packed up. I had finally completed my week at uni, with Nik and Abs doing the majority of the packing up during the week, so on my last day I got home to a packed van and was therefore lucky enough to say our farewells to the people we had met in the park over the last couple of months. The final pack up and clean up of mould and dirt after 7 months in one spot. Farewell photo with Joel, Sandy and their gorgeous kids. Will certainly catch up with them on the Sunshine Coast after they leave Darwin at the end of the year. The next morning after some terse words and many mumblings under our breath, as we tried to recall how to pack up again, we finally left town not long after 9am. 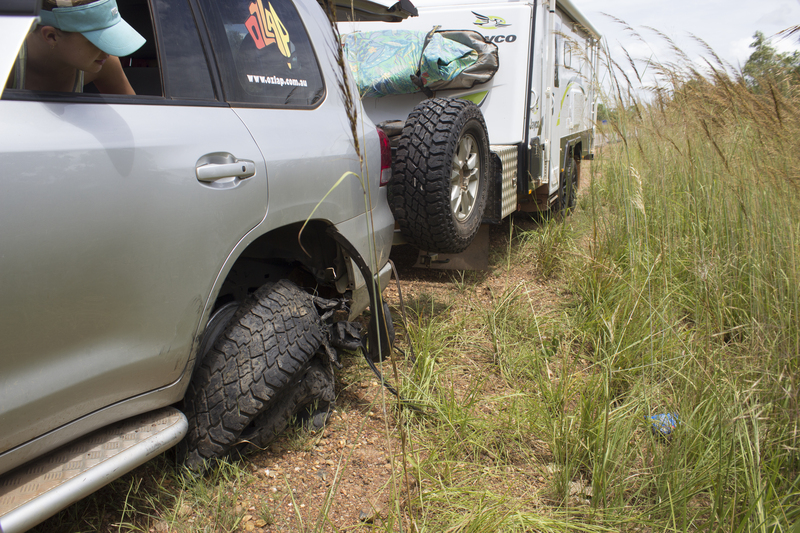 However, we only made it 160km south of Darwin when we heard an almighty bang, Nik had to work hard to control the car and the caravan as the rear passenger tyre proceeded to be shredded to pieces. After what seemed an eternity and lots of going from side to side on the road Nik managed to pull us over in order to get things cleaned up. The tyre had blown and was completely destroyed, so for the next 90 minutes Nik worked hard to change a very hot and heavy tyre on a very narrow shoulder of the road as we were not able to drive any further as we would have stuffed the rim. 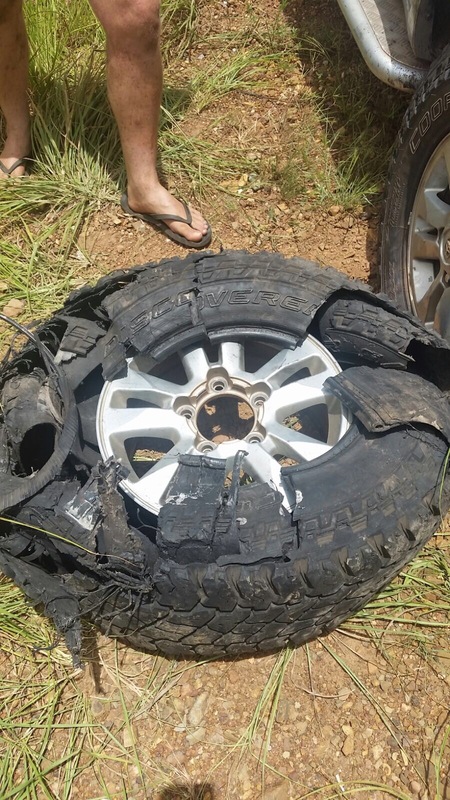 The fact that the car was on quite a lean and the hot sun was beating down, made it a less than ideal environment for changing the tyre. I did what I could….applied sunscreen and refilled his drink bottle every 5 minutes, while we tried to take the weight of the van off the car and then jack the car up enough to be able to put the new wheel on. Long story short we (Nik) did a great job and we ended up only getting as far as Katherine that night. Absolutely shredded……and bloody hot to touch and get off the car. Being a weekend we ended up staying in Katherine until the Monday so that we could get a new tyre, in the end we bought 2 new tyres (BF Goodrich). Considering we had a day to chill we also had a huge clean out of the caravan, filling 2 wheelie bins for the Salvos and another 2 for the tip. 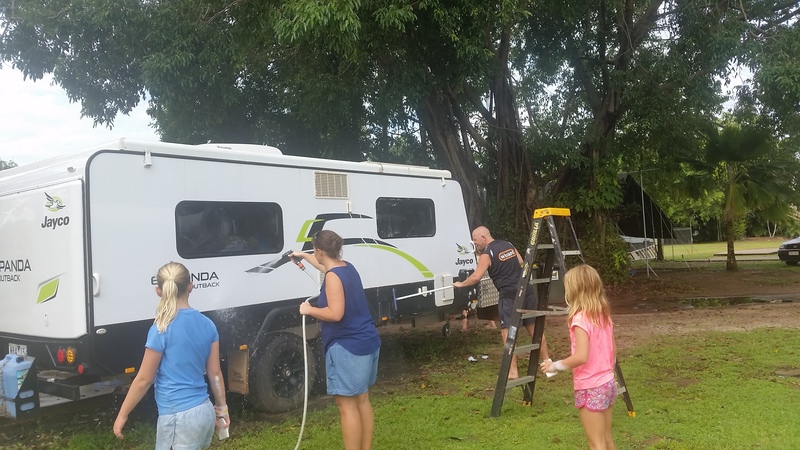 We finally left again on the Monday morning, stopping in at Mataranka for a swim and morning tea. 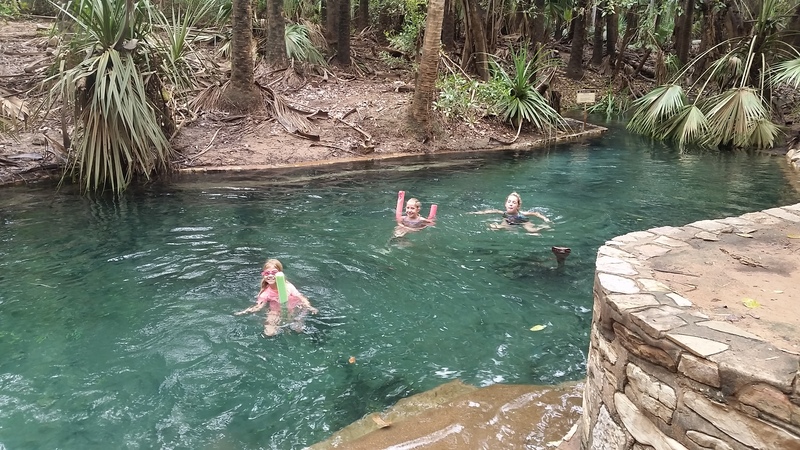 Whilst we clearly did not visit Mataranka in its prime, we still thoroughly enjoyed our swim and could imagine how beautiful it would be during the dry season. The area had recently had lots of rain as the surrounding gardens of the hot springs were full of mud and leaves and grass. 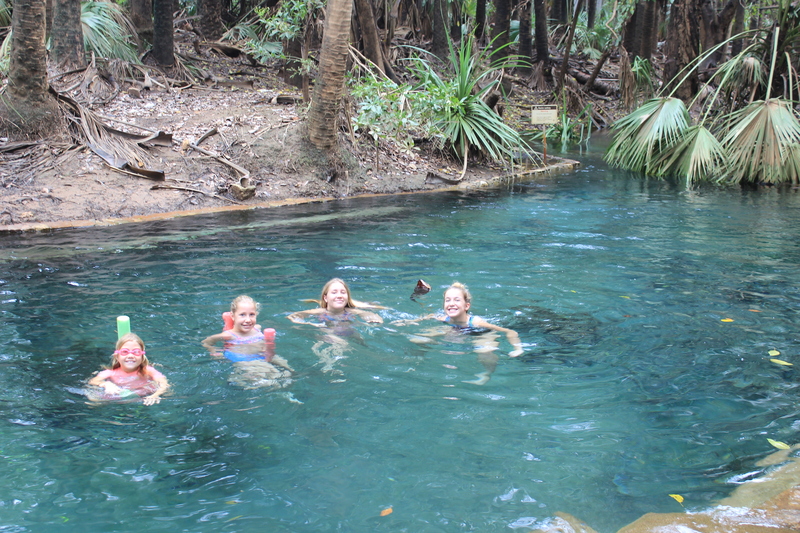 Relaxing at Mataranka Hot Springs. 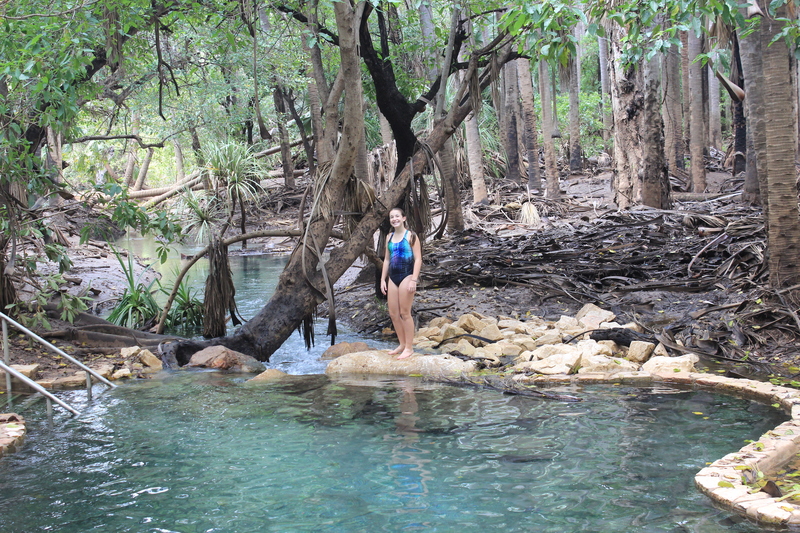 Zoe at Mataranka hot springs. The set up at Daly Waters Pub. 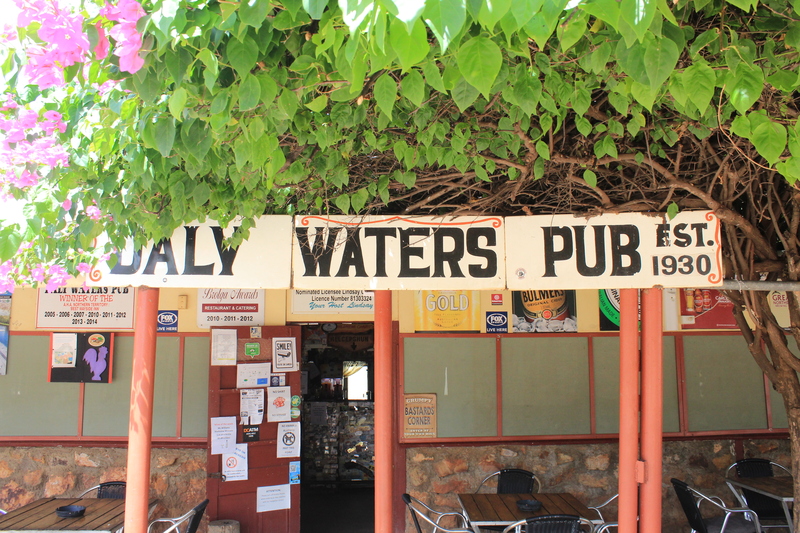 The lush entrance to Daly Waters pub. 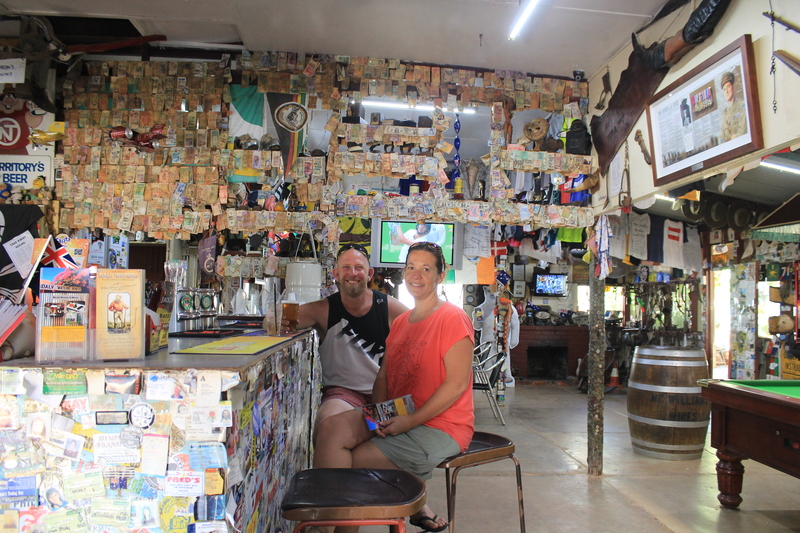 Having a quiet ale at the bar at Daly Waters pub. After a wet night and an even wetter pack up the next morning we were out of there not long after the sun rose. After turning east, we stopped in at the impressive Barkly Homestead for lunch, remarking on the lush green grass out in the middle of nowhere. 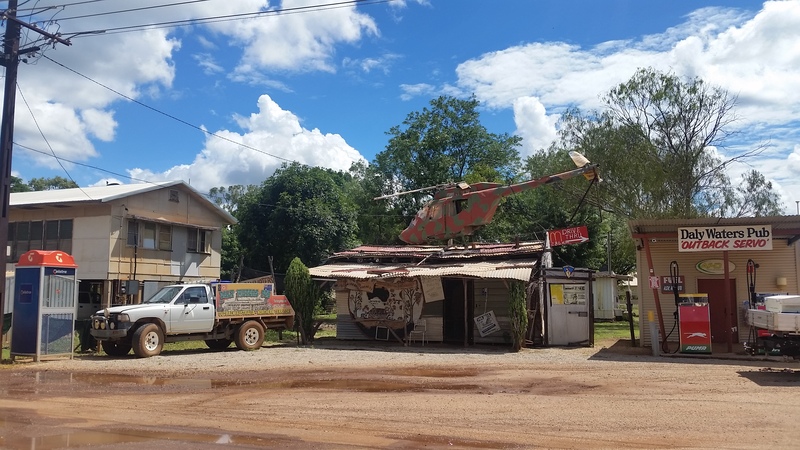 Even though this would be our last stop in the Northern Territory, we didn’t hang around too long as it was bloody hot outside and we still had a few more km’s to cover. 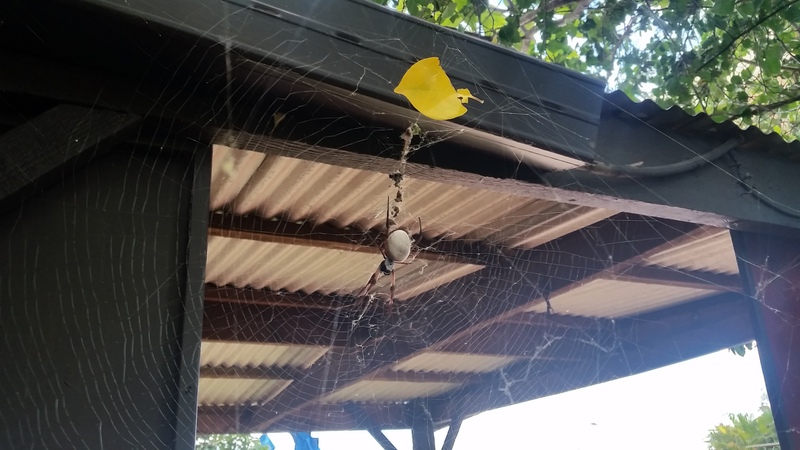 A massive spider looking after the entrance to the Barkly Homestead……. In total on our trip we have spent over 9 months in the NT and whilst we may joke about getting out of Darwin quickly, as a whole I think we have thoroughly enjoyed exploring the NT, from Alice to Uluru, to the East and West Macdonnell Ranges, Katherine, Mataranka Litchfield and Kakadu and yes even bits of Darwin, we have quite simply had a ball. But as usual we look forward to our next adventure and destination on our OZLAP……………………. 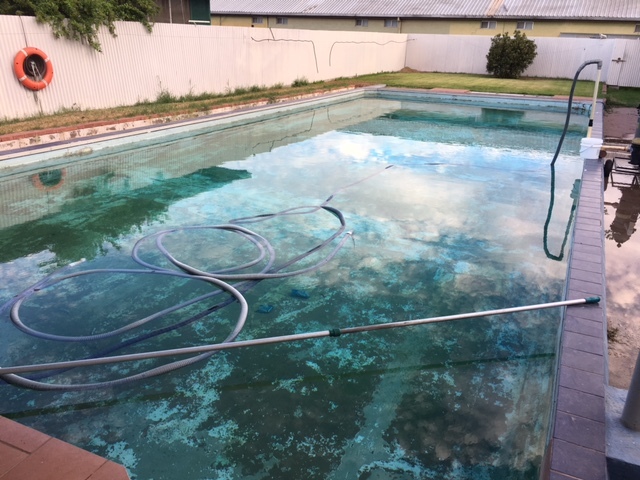 Previous Previous post: Darwin, NT, part two. 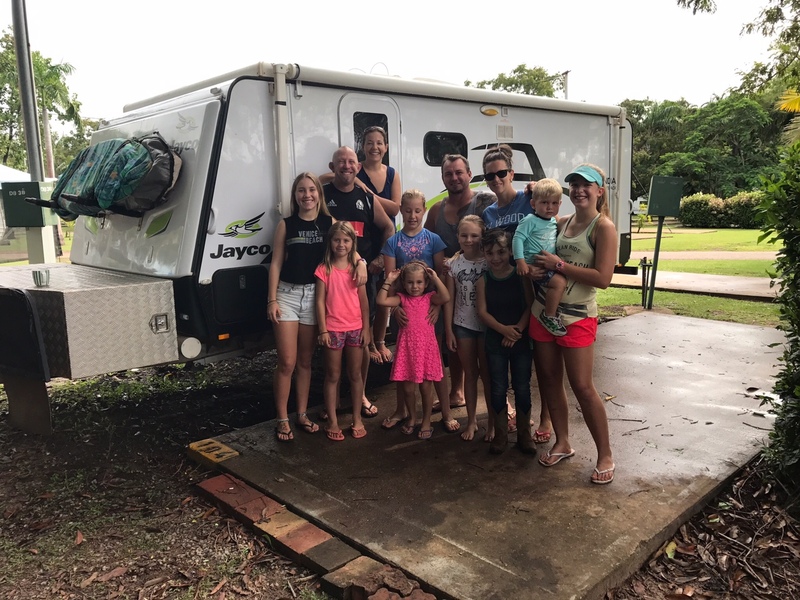 Hi nick Amy and girls I have followed you great trip thanks to your mum she has sent me all your blogs great stories and something u will all remember for your lifetime injoy the rest of trip in Queensland and wherever you go and thankyou for sharing it with us. Laurie.